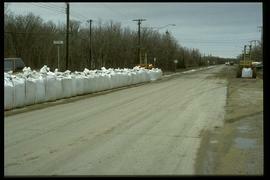 A photograph of a series of large sandbags near the intersection of St. Mary's Road and Chrypko Drive. A photograph of a sign advertising lots in the "Floodway Gardens" subdivision. A photograph of historic Bohemier House in St. Norbert Heritage Park during the 1997 flood. An earthen dike has been built around the house. A photograph of earthen and sandbag dikes on Sutherland Avenue near the intersection of Brown and Rutherford during the 1950 flood in Winnipeg. A photograph of flooded Tartan Way in East St. Paul during the 1997 flood. Stamp (on verso): M. J. Sym, Photographic Laboratories, 274 Main St., Winnipeg, Phone 95 395. - Photograph likely taken at time of 1950 flood, [1950?]. A photograph of high water near the Forks Market during the 1997 flood.